Do you want to buy a Quiet Mechanical Keyboard? Are you looking for a keyboard which provides best typing experience at a reasonable price? Well, here I have reviedew best quiet mechanical keyboard that you can buy in 2019. The Corsair Strafe RGB MK.2 features a boxy design with hard edges and no superfluous curves or bits of flair to make it resemble some kind of race car keyboard. Apart from the utterly optional and customizable RGB lighting and the texturized space key, the Corsair Strafe RGB MK.2 won’t seem out of place on an office desk. The performance of the Corsair Strafe RGB MK. 2 is, as expected, great, and comes with reliable switches. There seem to be no missed or false inputs, all thanks to the n-key rollover and anti-ghosting. Also, the somewhat concave keycaps and seemingly lessened wobble add on to an easy touch-typing experience. However, with the addition of the WASD gaming keycaps, the elevated right edge of the D key might get in the way of normal typing. Overall, it offers decent performance and is a great option to go with. As the name suggests, the HyperX Alloy FPS Pro is a tenkeyless keyboard. This means it lacks the numeric keypad of a full-size keyboard. The HyperX Alloy FPS Pro has been designed to be compact. It uses a solid steel frame topped by a metal alloy plate to keep the base thin and yet rigid. The thinner profile also means it does not require a wrist rest. This gives you a lot more space to use your mouse. Also, it comes with no keyboard software at all. It is an entirely driverless peripheral. The gaming experience is as you would expect with any high-quality mechanical keyboard, which is obviously a good thing. Typing is a breeze too. This one is a very simple keyboard which comes with no macros, no software and no USB pass-through. Logitech’s G413 is a mid-range gaming keyboard that is packed with a host of competitive features such as a sturdy design and a brilliant set of key switches. It is one of the best-lookingkeyboards you can buy in the mid-range price segment. It comes with a brushed aluminium finish and a borderless design, which means the keys stand out from the top of the chassis. It features a USB passthrough at the back, and in terms of layout, its pretty standard stuff. Logitech has chosen to use its own Romer-G key switches here. And while this might be a disappointment for most Cherry fans, some might be impressed by the unique characteristics of the Romer-G. They offer the ideal mix of comfort, responsiveness and clacky-ness which make this keyboard a great choice for both work and play. The Corsair K68 is a well-priced, superior quality gaming keyboard with lots to enjoy in the looks department and just as much to relish in the performance department. It features a straightforward design with a boxy-shaped main body of the keyboard that feels super sturdy. There are some sharp corners around the face along with smooth curves around the base. The Corsair K68 never hitches, never keeps a key triggered after you have let off, or releases a key you are still holding down throughout play sessions. Both the gaming and typing experience are wholly satisfactory. The K68 is an excellent pick because it offers a similar package to what its competitors do while coming in at a lower price. The HyperX Alloy Elite comes with a spacious design, authentic Cherry MX keys, dedicated media controls and features an interface that needs no software. It has an elegant sort of design. The square key caps take up the maximum of the keyboard’s rectangular body, leaving only a few small gaps to maintain even spacing. A bar placed above the Function keys has the keys for media, brightness, lighting patterns and game mode (which means that the Windows keys and Alt-Tab are disabled during games). With its smart layout and Cherry MX keys, the Alloy Elite performs fabulously in both low- and high-stakes gaming scenarios. It holds up extremely well to both furious key pounding and laid-back tapping, and it excels in both categories. Overall it can be said that the keys, layout and performance are all top-notch. Das Keyboard’s web-connected 5Q is a sturdy mechanical keyboard with stable software. The 5Q features a sort of general-purpose design along with a big tactile volume knob and media buttons. The primary selling point of this mechanical keyboard model is its “cloud-connected” nature. It enables you to receive notifications for just about everything (with the help of IFTTT and a few other services) via blinking, flashing, or color-changing key lighting. This mechanical keyboard is remarkably quiet. What else does it have to offer? Well, with the 5Q you get Das’ latest and greatest hardware yet, new exclusive switches that are good as well as durable, and full RGB lighting coupled with optional blank and translucent keycaps, which is unique for a Das product. Although it might not be the best pick for non-gaming usage, the SteelSeries Apex M750 comes with solid construction, consistent performance, and dazzling lights. The Apex M750 is SteelSeries’ one of the best gaming keyboards. It comes with mechanical key switches designed in-house and per-key lighting that will dazzle and impress the user. Its design is fuss-free but its lighting is complex. The best part is that it comes with a price right where you would expect to see it. It comes with floating keycaps which makes it easy to clean. 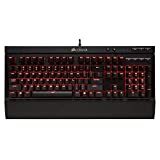 The most attractive feature of this particular keyboard is that SteelSeries Engine has given the Apex M750 a variety of lighting customization options that range from a simple static lighting to individual key colorization, or lighting effects stacked on each other. Although the lighting makes it unsuitable for office use. Also, it is not one of the quietest mechanical keyboards. When it comes to performance, the SteelSeries QX2 linear mechanical switches perform well. A nice variety of the features hinge on the SteelSeries Engine software, which permits all of the custom lighting. This also brings in per-game lighting profiles, which can prove useful if you switch between a lot of games or are new to some popular titles. Also, customization in the SteelSeries Engine is user-friendly, with abundant options that make it easy to switch between and see with a live preview. 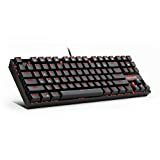 For those who move around a lot and need a dependable mechanical keyboard for gaming as well as general use purpose but do not want to pay exorbitantly for the frills of a high-end keyboard, the K552 from Redragon is a great pick. The construction is heavy duty, some might say it is even heavier than most other brands. Also, you get a red backlight with different brightness levels. The design and functionality seem at par with the best in the market and this keyboard is value for money. The design is humble and simplistic. You do not get a USB pass-through or 3.5mm jack connections. The key caps of the K552 are double-shot injection moulded keycaps. Double shot moulding refers to the process of moulding plastic around a preformed metal or plastic insert. This is what makes the key cap far more durable. The keyboard is tenkeyless in design, which could be a plus for many. When speaking of performance, the K552 is great for typing. Gaming is a pleasure with this keyboard and is an insane Moba/Shooter keyboard! The market is flooded with the good keyboard that provides a great user experience. But this sums up our list for the Best Quiet Mechanical Keyboards. Take your pick! None of them will disappoint you, for sure.